To be certified you must do the 2 days and the phone calls. Doing the 2-day training only option will get you the Continuing Education hours but not the certification in becoming a C-TFCBT therapist. Option 1: For a fee of $700, participants will register for the 2-day TF-CBT Certificate Program and the Consultation Calls. Option 2: For a fee of $350, participants will register only for the 2-day TF-CBT CE Hours. The total number of Continuing Education hours for Social Workers depends on whether you chose Options’ one or two. COURSE OVERVIEW: Children exposed to physical and sexual abuse, domestic and/or community violence, and other traumatic life events, dramatically increase their risk of severe emotional distress and potentially lasting psychological and interpersonal difficulties. A significant number of children are exposed to traumatic life events. From a psychological perspective, trauma occurs when a child experiences an intense event that threatens or causes harm to his or her emotional and/or physical well-being. Examples of traumatic events can include sexual or physical abuse, witnessing domestic violence, community and school violence, exposure to natural disasters such as a hurricane or flood or to events such as war and terrorism. Unfortunately, about one in every four children will experience a traumatic event before the age of 16. Trauma-Focused Cognitive-Behavioral Therapy (TF-CBT), developed by Judith Cohen, Anthony Mannarino, and Esther Deblinger, is an empirically supported treatment for children and families exposed to traumatic life events. This two-day training will provide an intensive review of all of the TF-CBT treatment components, with a specific focus on clinical implementation strategies, and will give participants an opportunity to hone and increase their skills in the powerful practice of TF-CBT. OPTION 1: Actively participating in the 2-day Training and Consultation Calls allows clinicians to move forward in becoming a certified TF-CBT therapist. Participants must identify a case to use on the twice-per-month group consultation calls. The consultation group calls creates an intensive opportunity for participants to sharpen their knowledge, understanding, and skills in the powerful practice of TF-CBT. The use of case presentations facilitates the understanding of how to apply TF-CBT to clinical work. Note that there are 12 twice-per-month group consultation calls to deepen TF-CBT practice and knowledge, which includes discussion of strategies to engage the child/adolescent and their caregiver, how to implement TF-CBT effectively, and case presentations. The instructor will provide further details on the expectation and on the calls. To see more information on how to become a TF-CBT certified therapist, please see https://tfcbt.org/tf-cbt-certification-criteria/. Training in the principles and techniques of TF-CBT including psychoeducation, relaxation and affective modulation, cognitive processing, and trauma narrative. For licensed social workers who wish to obtain continuing education contact hours through this course, New York State has specified guidelines for attendance of a multi-session course. We cannot administer partial credit – No exceptions. Please plan to attend both days of the course, as there is no opportunity to make up a missed day for the 2-day training. If you are a licensed social worker or a mental health profession in another state, please contact your Office of the Profession to ascertain if the training and hours in NYS are comparable to your states licensure requirements. Upon completion of the two-day course, a certificate of completion provides proof of attendance for 13 contact hours. 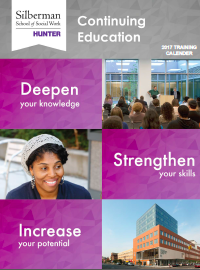 Continuing Education Hours – the New York State Education Department’s State Board recognizes Silberman School of Social Work at Hunter College, SW CPE for Social Work as an approved provider of continuing education for licensed social workers #0148. Step 1: Please note that there is an online pre-requisite for the 2-day training. This web-based orientation takes 5-8 hours to complete. This web-based orientation can be done in segments. Step 3. If you are not currently engaged in clinical work with children or adolescents, you do not qualify to participate in the group consultation calls at this time. Step 3: By the time the call groups begin, you are required to have at least one TF-CBT appropriate case that will last through the end of the calls. In a TF-CBT appropriate case, you have assessed that there is trauma and received “buy-in” from the parents about applying TF-CBT to treatment. Step 4: Identify which call group works for your schedule. Step 5: Call 212-650-3850 to register or register online at http://www.hunter.cuny.edu/ce with the course code SWTFCBTC AND SWTFCBT. Please make sure you register for BOTH components of the program. Please complete one form per component of the program. Also, please note that for the group consultation calls, you must complete all 12 calls in order to be eligible for CE credits. Carrie Epstein, LCSW-R is Assistant Professor in Social Work at the Yale University Child Study Center, where she is Director of Clinical Services and Training at the Childhood Violent Trauma Center. Recognized nationally as an expert in the field of child trauma and disaster response, for over 25 years Ms. Epstein has been providing treatment, clinical supervision, and consultation on new programs for children and families impacted by trauma and traumatic grief. As part of her current work, Ms. Epstein is responsible for developing and overseeing national training initiatives and national learning collaboratives focused on the dissemination of child trauma- focused evidence-based treatment models. Ms. Epstein was Senior Director of Child Trauma Programs at Safe Horizon in New York City, where she continues to provide clinical consultation and training on trauma-focused evidence-based mental health treatment in Safe Horizon’s five Child Advocacy Centers.